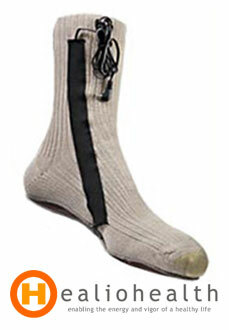 This heating sock is convienent for active sports persons like mountain biker, skiers, and hikers. The battery pack is quite light, with carrying case and attached control box. Includes a 110 volt "smart" battery charger. One cable from each heating sock is normally run up the leg between long underwear and outer pants and exits at belt-level. The cable connects to the controller/battery pack, which may be clipped to the belt on either side of the waist. The battery pack is quite light, weighing just 13 ounces with carrying case and attached control box.